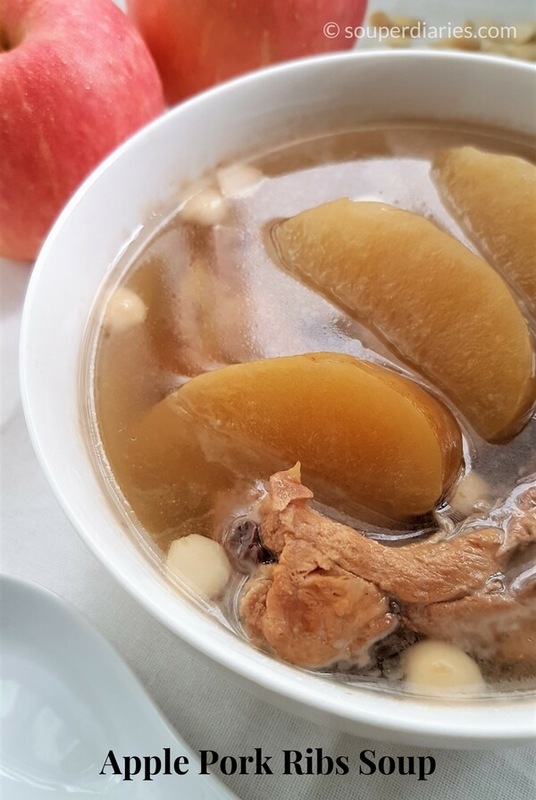 Apple pork ribs soup helps to moisten the throat and lungs and soothes coughs and sore or phlegmy throats. Naturally sweet tasting, it is one of my favourite soups and definitely help to quench my thirst during hot and humid weather. For many Chinese, we believe that drinking soups regularly is beneficial for our skin, promotes a glowing complexion and good health. I am no exception and often boil soup for my family. This apple soup is so easy to prepare. 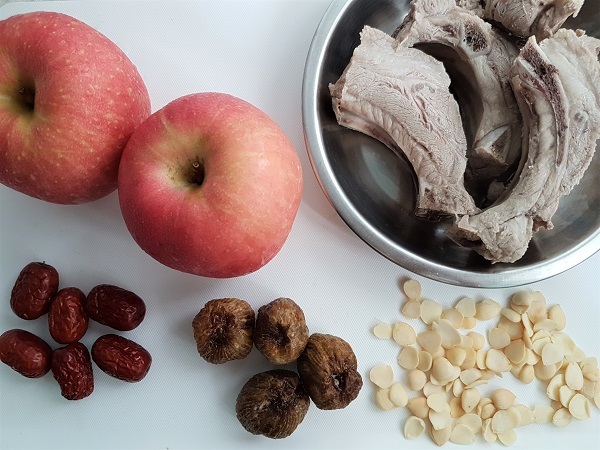 The main ingredients are the apples and pork. I added dried red dates and dried honey dates to further sweeten the soup. The apricot kernels in this soup provide a little crunch and they complement the softness of the boiled apples. In a Western diet, food is evaluated based on its nutritional content. From a Traditional Chinese Medicine perspective however, food has medicinal purposes and energetic properties. They can be selected and prepared to balance the body’s yin and yang and nourish the body to good health. Strengthens the stomach and spleen, improves immunity, counters insomnia and fatigue and build up energy levels and blood. It is traditionally boiled with dried longan and taken by Chinese women undergoing confinement after giving birth. Slightly bitter tasting, it helps to relieve cough and asthma, unblock the bowels, moistens the intestines and unblocks the bowels. It is mildly toxic so avoid taking regularly or in large doses. More information here. Neutral in nature, non toxic and they help to relieve heatiness and soothes coughs. A jujube preserved in sugar, dried honey dates are commonly used in Chinese soups for a natural sweet taste. #1. Wash the apples thoroughly as they will be boiled with the skin on. You can also peel the skin if you wish but I prefer to have the skin on as much of its valuable nutritional content reside in the peel. If you are concerned about pesticide and other agricultural chemical residues on the skin, use a fruit and vegetable wash.
#2. 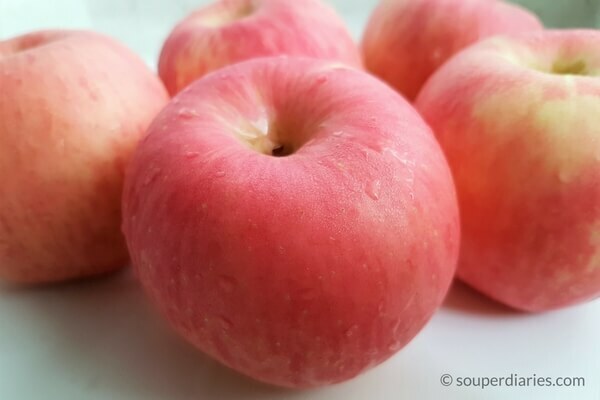 Do not overboil the soup or the apples will become too soft and will break easily when you ladle the soup. Simmer on low heat for 1.5 hours to 2 hours if you’re cooking on a stovetop. For pressure cookers, cook for about 40 minutes. #3. Dessert option. If you don’t fancy cooking fruits with meat, you can turn this soup into a delicious apple drink. Make this soup sans pork and add some rock sugar towards the end of the cooking time. Other Chinese soup to soothe cough and sore throat include Pear Soup and Lo Han Guo with Watercress Soup. Serve this soup on its own or with some steamed rice. For more soup recipes, check out my Slow Cooking Soup and Quick Soup recipes. Blanch pork ribs in boiling water. Remove, rinse and set aside. Rinse apples thoroughly. Cut into sections and core. Rinse all the dried ingredients (red dates, honey dates and apricot kernels). 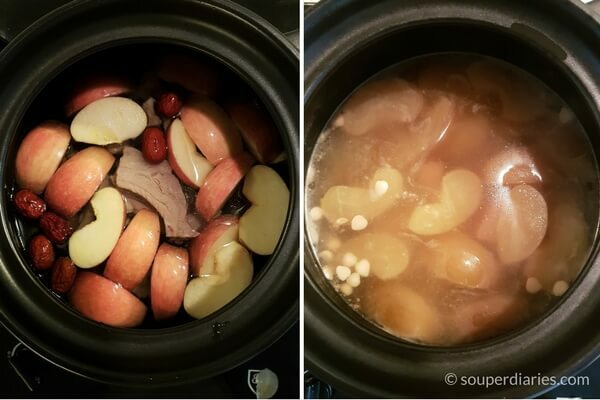 Put all ingredients (except apples) into a soup pot and bring to a boil. Once boiling, add the apples, lower heat and simmer for 1.5 to 2 hours at the most. Do not over-boil or the apples will be too soft and break easily when you scoop up the soup. Season with salt if required and serve. Hi Yvonne, beautiful post as always, I have a question, though. I know the main ingredient is pork and apples but wonder if you might have a modified recipe for vegetarians? I must say I have never had a soup that had apples in it. The combination you present sounds intriguing enough for me to try. I was brought up with North American type soups being plain pea or chicken noodle soups. I really appreciate the listed health benefits that you’ve listed for each ingredient…it just makes the soup sound that much more comforting. Having the knowledge that you are eating good healthy food and your children too is reassuring. I have never used or bought Apricot kernels. Can that be bought in a regular grocery store? Please keep this site going it is excellent and the print recipe card feature is perfect! Thanks for writing in. Sorry for the late reply. If you’ve not tried apple pork ribs soup, I highly recommend that you do. It’s really delicious and refreshing. I bought the apricot kernels from my local Chinese herbs shop. I’m not sure if they can be bought in a regular grocery store. If you can’t find them there, you could also try a Chinese herbal shop or Chinese dried goods shop. I absolutely adore the idea you are spreading: Food can be used as a medicine. I am Ayurvedic health practitioner myself and absolutely believe that the food we eat, or the absence of it in terms or fasting, has a huge influence on our entire being! I love the way you are presenting the recipe and your pictures are absolutely mouth watering. I will sure to give this recipe a go when the winter properly sets in. It looks like a fantastic crowds pleaser. I will need to make two varieties, one with pork and an other using vegetarian alternatives, do you have a suggestion or maybe an vegetarian soup with same effects you can recommend? Thanks for writing in. Yes, each food is unique and can be used to prevent and treat specific diseases. Balance is very important in a Chinese diet and when the body becomes imbalanced, that is when illnesses arises. 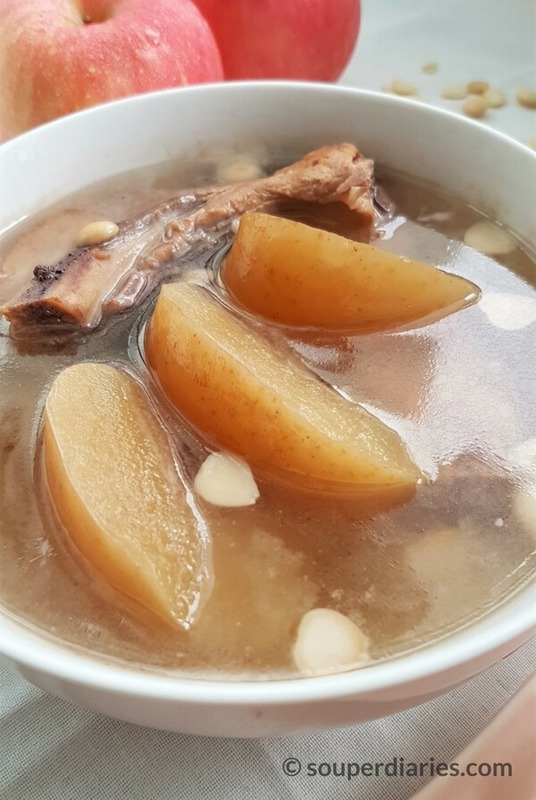 For a vegetarian alternative, you can boil this Apple Pork Ribs Soup or the Pear Soup without the meat and add some rock sugar towards the end of the cooking time. It will be a refreshing drink for the whole family. Both are good for soothing coughs and sore or itchy throats. Yes, this is true for Ayurvedic diet too that I follow. Thank you very much, the pear soup also looks delish! I always say that food has to look as good as it tastes and you certainly manage that. I will try both for my large family, which is a mixture of vegetarian and meat eaters.